Next are the short stretchers. While the long stretchers are bounded by the placement of the legs, with lots of room to choose from, the short stretchers are bounded by the width of the top, minus the width of the legs. No need to measure the main length, just set the pieces out and mark the shoulder lines where they cross. 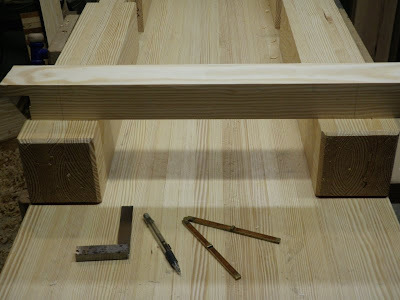 Then measure for the tenon lengths. Since my small fine-toothed backsaws didn't do so well on the long stretcher tenons, I moved up to medium size saws. These stiffer blades with larger teeth did a much better job. 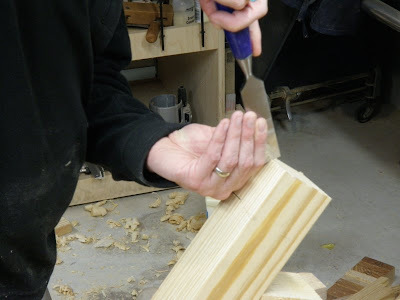 In this article, Chris Schwarz describes tenon shoulders as a first class cut, meaning make it your best, because it will show. So I marked the shoulders with a chisel and pared a small trough for the saw to ride in. That way I know the cut is exactly on the line, not offset, and not skewed. 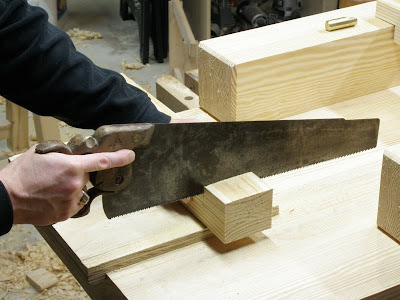 This is the way to keep your saw from jumping around when starting a cut. 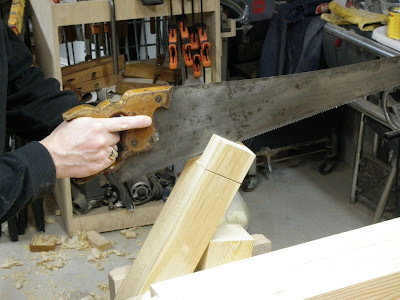 Cutting the shoulders with a medium cross cut saw. Cutting the cheeks with a medium ripsaw. Notching the start of the cheek cut with a chisel. 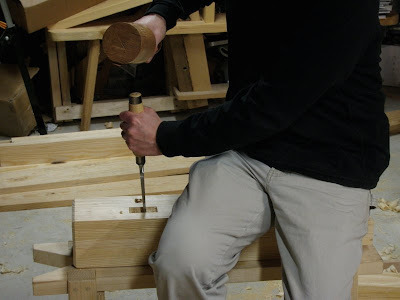 Starting the heavy work: chopping the leg mortises. The mortises are fairly time-consuming, made more so because they are large and I didn't have a mortising chisel of the full width. This is one of those operations where you get most of the way in 10 or 15 minutes, then spend the next 20 or 30 fine-tuning the last little bit. I'm going for a snug fit, trying to avoid over-trimming. That's the challenge with mortise and tenon. You can pare away to loosen the fit, but you can't add it back to tighten. Well, you can glue in veneer-thin shims if you really blow it.